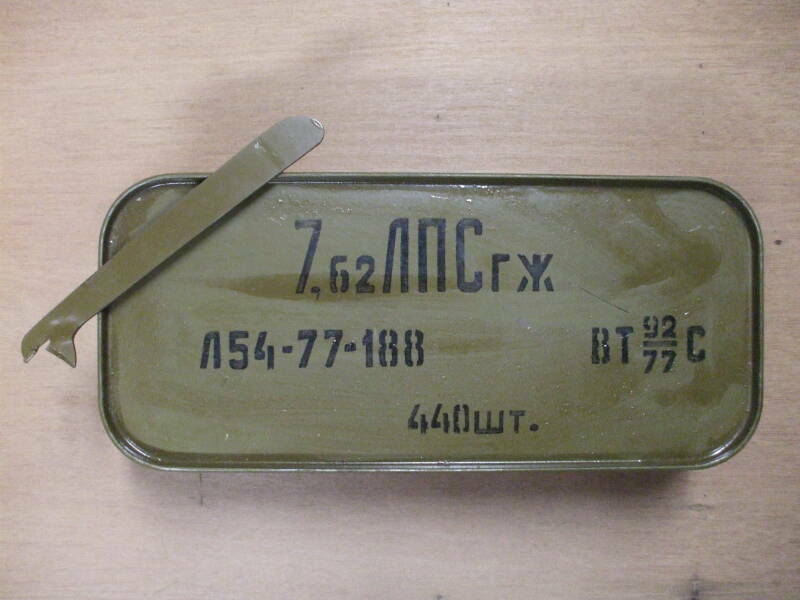 When you buy Soviet or Russian military surplus ammunition in "Spam cans" contained in wooden crates, you will find that the containers have cryptic labels. The markings clearly tell you about the bullet type, powder type, and year and place of manufacture, if you know how to decode the markings. Here is how to read Soviet military surplus ammunition labels. Military surplus ammunition for classic Warsaw Pact weapons like the Mosin-Nagant or Kalashnikov usually comes in containers labeled in Russian using Soviet military nomenclature. 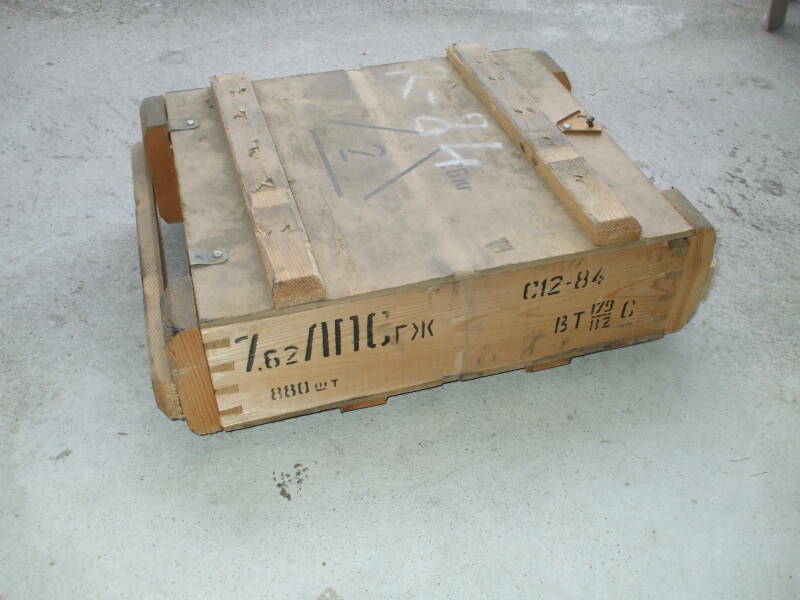 Here are two views of a wooden crate containing 7.62x54mmR ammunition. 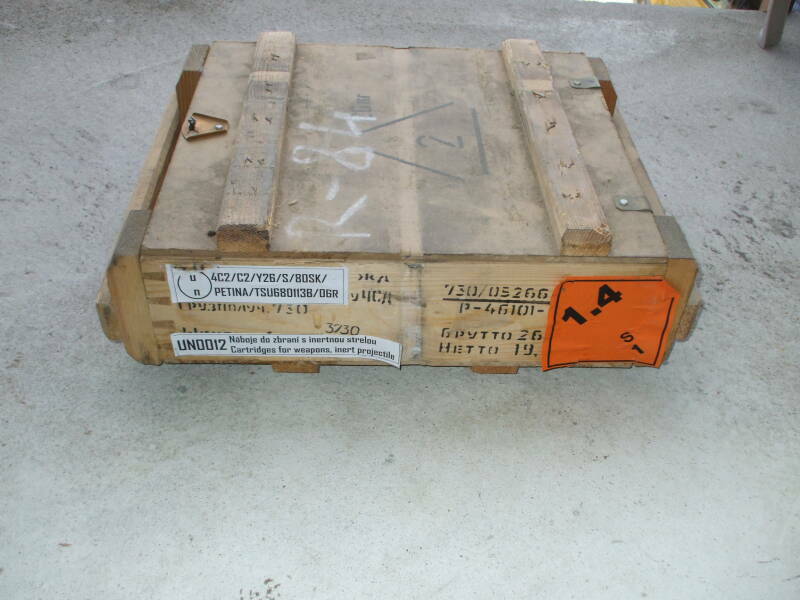 Once you know how to read the markings, you can clearly see that this crate contains 880 rounds of 7.62mm cartridges. 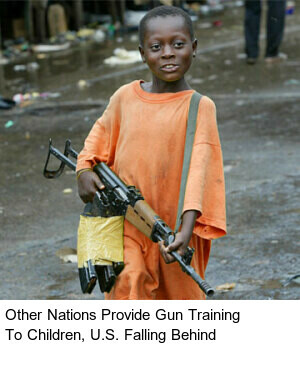 The bullets are the standard military ball, not armor-piercing, tracer, or other even more exotic types. The cartridge cases are the usual bimetallic cases, steel clad with "gilding metal". How old? The powder was manufactured in 1977, the same year the cartridges were loaded. Manufactured where? The powder was manufactured in Kemerovsk, and the cartridges were assembled in Novosibirsk, if that matters to you. Inside the wooden crate are two green metal "Spam Can" containers, as shown here. Resting on top is the included can opener. These are Russian military surplus, or more precisely, Soviet given their vintage. Let's start with the easy part. 7,62 specifies the caliber. Like most Europeans, Russians use "," to indicate the decimal point. Next, almost as easy: Did you notice that the wooden case was marked 880ШТ and it contained two metal packages marked 440ШТ? ШТ is short for штука or shtuka — item, thing or piece. Two 440-round cans go into one 880-round case. Realize that, of course, the Soviets used the Russian language's Cyrillic alphabet. In some cases, such as the letters А К, М, О and Т, our corresponding Latin character looks the same. But often, the Cyrillic only looks like a Latin one. For example, Cyrillic В is equivalent to Latin V, Cyrillic Н is equivalent to Latin N, and so on. Others, like Cyrillic Ж, И, Ш, Щ, Я and several others are unlike anything in the Latin alphabet. Here is a quick guide to the Cyrillic alphabet. Now let's decode the rest of the ammunition case markings. ЛПС means Light ball bullet with mild steel core. An added two-digit number would indicate a bullet with a pattern introduced in that year. For example, Б-30 and Б-32 are armor-piercing bullet designed introduced in 1930 and 1932. So, 7,62ЛПСГЖ simply means it's 7.62mm light ball bullet with mild steel core (ЛПС) in a gilded or copper-washed steel case (ГЖ). Л54 simply means lot series Л54, you would have to check with the factory records to figure out what that really means. The rest means that it was manufactured in 1977 at factory #188. That factory is in Novosibirsk (or Новосибирск) as this table tells us. The table is from the DIA "Small-Caliber Ammunition Identification Guide". This table is for Russian factories. Other countries of manufacture will have their own codes. Bulgarian, for example, will have "10" in a double circle (and use БР as an abbreviation for "count" or "quantity"). The production year and factory number, 77 and 188, appear in the somewhat indistinct headstamp. 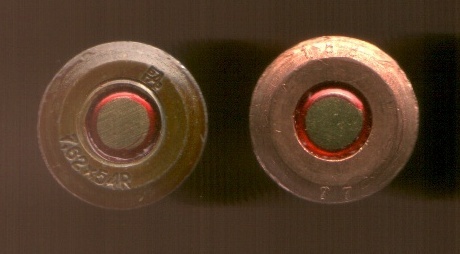 That's a modern Russian commercial Bear cartridge at left, and one of the rounds from this surplus case at right. As for the powder type and source, as seen above, ВТ is the type, С is the source, and it's lot #92 from 1977. I have only limited information on how to interpret the type and source codes. I don't know what type ВТ is, but source С is the "Progress" factory of Kemerovsk. I see a lot of confused postings in on-line forums where people think that ВТ means "Boat-Tail" bullet. Remember that these cans are labeled in the Cyrillic alphabet and so ВТ is equivalent to Latin VT! However, the frequency of this misunderstanding suggests that ВТ is a common powder type. I would guess that the В stands for винтовочный or vintovochniy, meaning "for rifles". ВУФЛ — Винтовочный Уменьшенный ФЛегматизированный Пороха. Small-grain phlegmatized gun powder. A phlegmatizer is a material added to an explosive to make it more stable, less susceptible to detonation and safer to handle and transport. ССНФ 30/3,97 — Стрелкового оружия Сфероидная — Нитроглицерина — Флегматизатора. 30 = average size of grains in hundredths of millimeters; that is an average grain size of 0.3 mm. 3,97 = average thermal energy developed, in MJ. П-125 — Пистолетные пироксилиновых пористые пороха трубчатой формы — 125. Pyroxylized powder, porous tubular grains, for pistols. Pyroxylin is a nitrocellulose compound soluble in ether and alcohol. П-45 — Пистолетные пироксилиновых пористые пороха трубчатой формы — 45. Pyroxylized powder, porous tubular grains, for pistols. Don't count on this list being 100% complete or accurate. There is debate among specialists on the details of these. Factories used varying marks, sometimes (but not always) because the factories were renamed. Factory #577 in Solikamsk was established in 1941, then renamed Ural in 1966. Marks might be for a city name at times and the factory name at other times. "K" might indicate the city of Kazan, or maybe the S. M. Kirova factory in the city of Perm. Also see all the reorganization and renaming after the end of the Soviet Union, plus the spelling differences between Russian, Ukrainian, and Belorussian. А — завод No100, Алексинский химический комбинат — Aleksinskiy khimecheskiy kombinat — Aleksinsky chemical plant. Б — завод No577, Соликамский пороховой завод Урал — Solikamskiy porokhovoy zavod (1941), Solikamskiy zavod «Ural» (1966) — Solikamsk powder factory (1941), Solikamsk factory "Ural" (1966). Е — завод No580, Красноярский завод Енисей — Krasnoyarskiy zavod «Yenisei» — Krasnoyarsk factory "Yenisei". К — завод No98, Казанский пороховой завод — Kazanskiy porokhovoy zavod — Kazan powder factory. Or, К might indicate the Perm factory, which was named for С. М. Кирова (that is, S. M. Kirova) while С may mean the Kazan factory. М — завод No98, Пермский пороховой завод — Permskiy porokhovoy zavod — Perm powder factory. Or possibly Kazan, see above. Р — завод No101, Рошальский химкомбинат — Roshal'skiy khimkobinat — Roshal chemical factory. С — Кемеровский завод Прогресс — Kemerovskiy zavod «Progress» — "Progress" factory of Kemerovsk. Or possibly Kazan, see above. Т — завод No204, Тамбовский пороховой завод — Tambovskiy porokhovoy zavod — Tambov powder factory. Ш — завод No9, Шксткинский завод Звезда — Shostkinskiy zavod «Zvezda» — Shostkinsk factory "Star". ШЛ — завод No6, Морозовский химический завод — Morozovskiy khimicheskiy zavod — Morozovskiy chemical factory. It was designated ШЛ because it had earlier been the Шлиссельбургский or Shlissel'burgsky powder factory. Ю — Гос. НИИХП, г. Казань — Гаучно-Исследовательский Институт Химических Продуктов — Gosudarstbenniy Nauchno-Issledovatel'skiy Institute Ximicheskikh Produktov, gorod Kazan' — State Scientific-Research Institute of Chemical Products, of the city of Kazan.